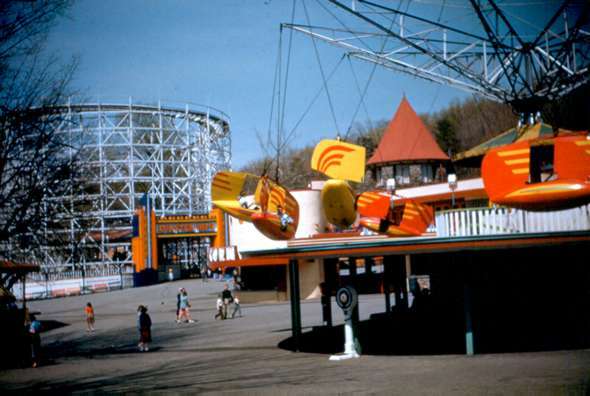 Glen Echo Amusement Park in the 1950s. Glen Echo was one of 2 amusement parks serving Washington in the 1950s. The other was Marshall Hall. Both were adjacent to the Potomac River. Glen Echo was easiest to reach from Northwest Washington either by automobile or by street car. The street car ran on its own right of way between Cabin John and Georgetown offering convenient access to the park from Washington. It also provided an ideal commuting route for people living along MacArthur Boulevard. It probably offered a faster ride to downtown DC then than is available today. We enjoyed the fun house the most as one could spend hours there riding on carpets down the giant slide or walking through the revolving barrels. There weren't a lot of rides at Glen Echo but we could never get enough of it.